The mechanical, robotic striving of university politburos and their jack boot managers have always been interesting when it comes to one particular topic: the role of technology and its adoption. For it is in technology that the mediocre paper clip shuffler can claim to have achieved something – on someone else’s back, naturally. 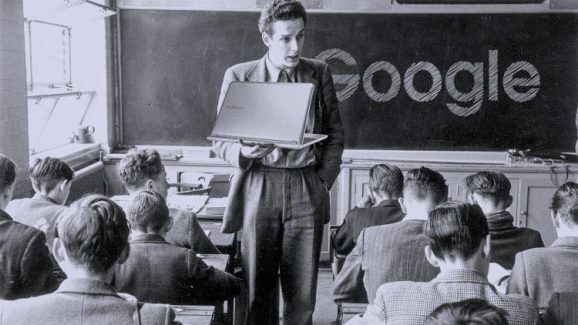 The shift to Google by universities as a storage and communication mechanism was something taken with a breezy obliviousness to its implications. For Google, it was a magical boon: mass concentration of staff and student data, cloud facilities, the magic of information. Such decisions are generally taken without asking the staff who actually use it – the nature of university management is piously anti-democratic, with all the usual balloons of sentiment about faux consultation and the like. Google’s move into the university sector with a mixture of predatory zeal and seductive wooing was inexorable, mimicking the cyber colonisation drive of Steve Jobs at Apple (“computers are bicycles for the mind”). In schools, Google has built a relentless, unquestioned empire, taking root in such systems as Chicago Public Schools, the third largest school district in the United States. As the New York Times noted in May 2017, such an event heralded “the Googlification of the classroom.” Teachers became Google grunts advertising products to other schools, bypassing school district officials. Students became Google converts, effectively disabled from considering any alternatives and indifferent to pure knowledge. They have become the new worker bees. Such gush and wobbly prose characterised the nature of such unwanted missives. (Most staff, at least the sentient ones, could not have cared less). And Google was certainly winning over its competitors, most notably Microsoft. In 2011, it scored the coup of coups by netting University of California at Berkeley. But some universities, after conducting their whirlwind Google romance, soured over the giant company. UC Berkeley students and alumni contended in a law suit in 2016 that Google had given the false impression that email accounts would not be scanned for commercial purposes. In 2015, Macquarie University reconsidered a move it undertook in 2010 to migrate some 6,000 staff from its Novell GroupWise to Gmail. Students had already commenced using Gmail in late 2007. Being careful to market such economic reasons appropriately, the Macquarie public relations unit was keen to emphasise that the university had only gone with Google after being reassured that generated data would be hosted in the European Union. With data protections being more securely moored in the EU, this was a consideration decorated to sell. To have hosted it in the US would have naturally brought the US Patriot Act and Digital Millennium Copyright Act into play. With a change in hosting policy on the part of Google, Macquarie found itself veering into the arms of Microsoft and Office 365. That company had, it so happened, opened two Australian data centres in 2014, a point that alleviated the infrastructure impediments that bothered the paladins at UC Berkeley. The move to Office 365 is simply exchanging one demon’s credentials for another, and the rosy line being parroted by university management must be unpacked with diligence. The example offered by RMIT University, for instance, in abandoning Google is fittingly opportunistic, with one email circulated amongst staff finally revealing why one of Australia’s largest teaching institutions is moving to Office 365: “RMIT strategic vision is to expand into China. Google is NOT supported in China.” A truly mercantilist sentiment. Dr Binoy Kampmark might well get upset about the mega-companies such as Microsoft and Google, but those who got in early in technology do well in their monopolies until they are made redundant by other megastars. Don’t like digital technology? Try biro and paper or hand-driven type-writer. And imagine the storage problem if all information was on paper. About 20-25 years ago many people did not know what the internet was, let alone used it. About 50 years ago the question was whether students in schools should be allowed to use biros. Yes, Matters Not, like London Bridge standards have been falling for ever. Before the biro, the fountain pen was outlawed. there might be reasons for banning fountain pens. I do not know the reasons, but it might have something to do with equality, which is one reason for uniforms. Otherwise pens become items of competition one against the other. Besides, fountain pens can leak, or run out of ink, or be stolen. Instead, students, as you know, were given simple ink pens. And there were ink monitors and someone had to clean out the ink wells. Some students had inky fingers. Today, there are education people who would like to ban computers. Guest. The lessons to be learned are there in the Sabre Toothed Curriculum. Or in the hard copy if you prefer. Weird that it is so often seen as a choice between Google, or Microsoft, or nothing. Many countries around the world are abandoning both and opting for Linux, with its vast library of community-built, completely free software — not just free as in beer, but free as in freedom to add to and alter. I can use my computers to do almost anything I wish — view the web, built websites, write books, write fancy graphical documents, design diagrams, paint pictures, edit and enhance photographs, create animations, build 3D virtual worlds, create and calculate spreadsheets, capture and edit sound and video, create multitrack music, explore speech synthesis and speech decoding, build neural nets to experiment with artificial intelligence, program in any of hundreds of different computer languages, explore planetariums including some that let you visit 3D recreations of the planets and moons, organise my time with reminders, schedulers, and alarms, and much, much more… and I can do all this entirely at zero cost, and if I feel so inclined, I can contribute my own enhancements to the programs I use to do such things. With Linux I’m not limited by how wealthy I am, but by my interest to do those things. Trying to work in tightly controlled environments like Microsoft Windows, or Apple’s awful MacOS, or Google’s Android too often straightjackets the user in multiple restrictions. In comparison, Linux actually encourages the user to play with its guts and tweak and alter things, helping them to dip into the waters of programming as deeply as they wish. At the same time it gives them the option to spend their time using the applications and never bothering with programming at all. In Linux you’re not forced in any direction. Google and Microsoft have notorious security problems. Linux, with its completely open structure, is probably as free of security flaws as it is possible to be. There are hundreds of different kinds of Linux, making hacking them all a virtually impossible proposition, and certain variants are built entirely with security in mind, making them as safe an environment as possible — certainly safer than any corporate solutions. It is interesting that all the supercomputers in the world, and most of the internet servers run on Linux. I guess it should not really be a surprise that monolithic educational institutions are so shortsighted, relentlessly governed by money, and so willing to sell out their students. I’ve long felt the end coming for such organisations. I think self-propelled learning will increasingly be the way of the future.